I spent yesterday afternoon cutting 3 1/2" strips of my batiks to start a new project. I chose these happy colors that remind me of spring. After all, it is officially spring. Today looked like anything but spring. We ended up with around 8 inches of snow on the ground. This gives a little better idea of the snow depth. As you can see there was some blowing and drifting. The weatherman says it will be 59 degrees on Saturday so this will all be gone by then. I put my boots on and went outside awhile today to enjoy the last snow of the season (hopefully). We celebrated Daniel's first birthday on Friday evening. Here he is...before the cake! Here are the last of my quilt show photos. I don't have a record of the quilt makers unless they won a ribbon. Normally they hand us a program with a list of all the quilts and their makers along with a list of the vendors. This time there was just a list of winners. This is a variation of the Civil War Bride Quilt...hand quilted. It was just beautiful. I don't think this is exactly the Civil War Bride pattern, and I don't think it is A Bountiful Life either. Any ideas? It was made by Joyce Wuehle. Love Eeyore's Garden by Linda Upp of Sharonville, Ohio. This one is Tulip Fields by Betsy Glassey of Bloomington, Indiana. By Carol Schwankl. I'm pretty sure this is a Judy Martin pattern. I think it might be Snake River Log Cabin. This one is Once Upon A Time by Mary Buvia of Greenwood, Indiana. 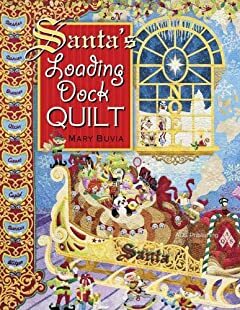 Mary also has a new book published called Santa's Loading Dock Quilt based on her award winning quilt from last year. By Margaret Solomon Gunn. The ribbon is for Honorable Mention in the Mixed Technique category. These last few are small quilts. This log cabin by Kaye Koler called Home at Last won 3rd prize for Small Scale Quilts. Here is the 1st place in that category by Mary Kay Mouton called Buried Treasure. Dreaming Cat by Sandy Curran won Honorable Mention in Small Scale Quilts. I love that kitty face. That is the end of my quilt show photos. I divided them into 3 separate posts so it doesn't take you forever to go through them. Someone wrote and asked me if I had a quilt in the show. Not this year, but in 2010 I entered two of my quilts in this Bloomington show. I had never entered or displayed my quilts anywhere before, and I won a Judge's Recognition ribbon on this one called It's Just A Nine Patch. I also entered my green Nearly Insane called Lime Phosphate in 2010. 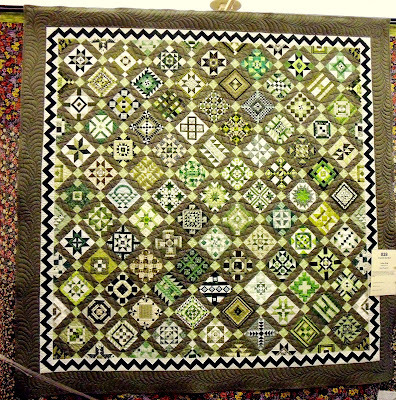 Here are some of my favorite quilts from the 2013 Indiana Heritage Quilt Show held last week. I didn't realize that the list that I had didn't list the names of all of the quilt makers. America, Let It Shine by Sherry Reynolds won Best of Show Wall Quilt. This one is Bonnie Hunter's quilt....can you tell by all the pieces? It was gorgeous The red one to the left was Becky Goldsmith's. Another great pineapple...my apologies. The photo is blurry and I can't zoom in on the name of the maker. Lots of stitching done on this Kim McLean pattern. This one is Best First Entry by Mary Olson. The quilt is Acanthus with a Twist. This one is by Mary Olson, too. She does beautiful applique. Tea with Miss D. by Sandra Leichner won 1st place in the Mixed Technique category. Magic of the Rose by Kristin Vierra won Honorable Mention in the Appliqued Bed Quilt category. A Pink Rose Garden for Zoe made by Carol Schwankl. The quilting on this one is just beautiful. The pattern is Rose Sampler Supreme by Rosemary Makhan. There was a lot of inspiration at this show. It would be really hard to choose a favorite. I have a few more quilts to show you next time. On Saturday my friend, Pam picked me up and off we went to Bloomington, Indiana, to the Indiana Heritage Quilt Show. The first thing we saw after the teacher's quilts displayed in the downstairs lobby was a huge display of quilts made by Indiana quilt and sewing guilds to benefit the Alzheimer's Art Quilt Initiative. Here are just a few of my favorites that were on display. Keep in mind that these quilts are no larger than 9" X 12". The workmanship in these quilts is amazing. Sorry there was not a list of the quilt makers, and my photography isn't good enough in most cases to read the name. These hexagons were made from old shirts. Laurel Burch fabric...maybe a panel used in this one. Sort of a four patch done like a stack and whack. A tiny storm at sea. The centers of these stars look like tiny stack 'n whack blocks. This one was gorgeous with ribbon embroidery, ruching and beading. Interesting pinwheels and look at the fussy cut flowers in the centers of the churn dash blocks. Love these tiny log cabins and the setting. More log cabins. Interesting machine quilting. This bird looks like he was made with fabric made from tiny scrap pieces. This was amazing made with thread play. Very creative. The sashing on this one was perfect. A tiny twister. I love the background with all the pins. Here you can see the number of quilts on display. I think there were more than 200. It's been awhile since I posted. I've been doing some sewing, but mostly I've been making pillowcases and some little dresses to donate to different charities supported by our quilt guild and church. And, I've been babysitting with this little guy quite a bit the last two weeks. Daniel will be a year old in 10 days. Thanks for visiting, and I promise it won't be so long between posts!